Summary (from Amazon): The true story of one family, caught between America's two biggest policy disasters the war on terror and the response to Hurricane Katrina. Abdulrahman and Kathy Zeitoun run a house-painting business in New Orleans. In August 2005, as Hurricane Katrina approaches, Kathy evacuates with their four young children, leaving Zeitoun to watch over the business. In the days following the storm he travels the city by canoe, feeding abandoned animals and heeling elderly neighbors. Then, on September 6th, police officers armed with M-16s arrest Zeitoun in his home. Review: I have wanted to read this book for a long time so was really pleased when my book group chose it this month. I found it to be interesting on so many levels. Non-fiction can be dry, let's face it. 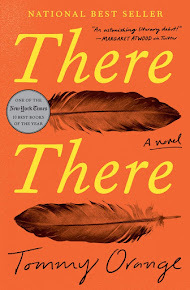 But, Dave Eggers is a master storyteller who keeps the reader amused, interested, and turning the pages to find out what happens next. We get to know Zeitoun, his wife Kathy, and his family in Syria thorough anecdotes, their memories, and information that Eggers got from extensive interviews and documentation of the events in the book. Zeitoun sounds like a great guy: he is generous of his time and his skills; he cares about his family (which is evident from the way he thinks about them and stays in contact with them even though they are far away); and he is thoughtful. 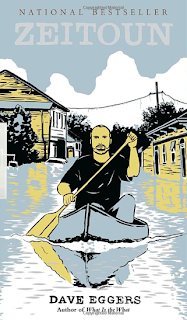 All of these attributes come into play as Zeitoun stays in New Orleans after Katrina hits. I don't want to give away too much of the story, but he helps neighborhood animals that have been left behind by their owners, he helps elderly neighbors who are stuck in their houses and surely would have died without his help. As the basic infrastructure and support systems of New Orleans crumbled around him, Zeitoun and a few friends step it up and become one of many "teams" that do good in the face of disaster. The second half of the book details Kathy's evacuation, her time in Phoenix, and Zeitoun's experience once he is arrested. Yes, arrested. To me this is the most shameful part of the book: arresting someone who is helping and treating them as inhuman. Before I read the book I thought he was arrested because he was Middle Eastern, but that isn't the case. However, the treatment he receives definitely has the tone of "terrorist" and as if he is a danger to the US. During the aftermath of Katrina I remember being horrified at the situations that people were in, the disaster of the Superdome, and more. This book brings to light more details of those weeks and months in New Orleans when all basic infrastructure fell apart, the police and soldier presence sometimes contributed to the mess that was created. It is a testament to the people of New Orleans that the city has bounced back!